Breakfast Fail | Keep It Up, David! I was curious what would happen if I added a scoop of protein powder to my oatmeal. So that’s exactly what I did. 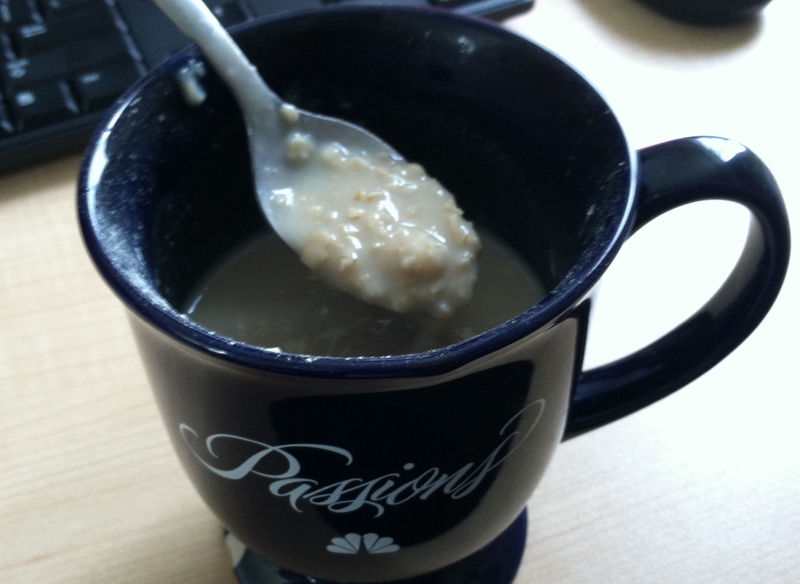 That mug has 1 packet plain instant oatmeal, one scoop of vanilla protein powder, and about 1 cup water – more than you need for just oatmeal, but, like I said, there was more in there than just oatmeal. Yep. Disgusting. I’m already not a fan of that brand of protein powder to begin with (it’s really chalky), but I thought that perhaps the oatmeal would mask the chalky taste. It didn’t. The powder also seemed to prevent the oatmeal from soaking up the water, so it was a mealy, watery, chalky mess. But… I ate it anyway, because I was hungry and I don’t like wasting food. I’m not going to make it again, though. And yes, that is my “Passions” mug, thank you for noticing! It’s my favorite mug that I’ve used at every job I’ve had for the past 8 years. Remember when Luis and Fancy were hot on Alistair’s trail in Rome, and Alistair let those lions loose to attack them? Good times. Just in case you’re wondering, there was a character named Fancy on “Passions,” and her sister was named Pretty, except for that Pretty wasn’t very pretty, not after Fancy accidentally dumped acid on her face while they were hanging out by the pool. Surely someone else remembers all this besides me! Switching topics, I have a new skyscraper to add to my collection. I spent 15 minutes on the StairMaster before hitting the weights, and in that time, I climbed 60 stories. I found a skyscraper in a country not yet represented in my collection… Kuwait! 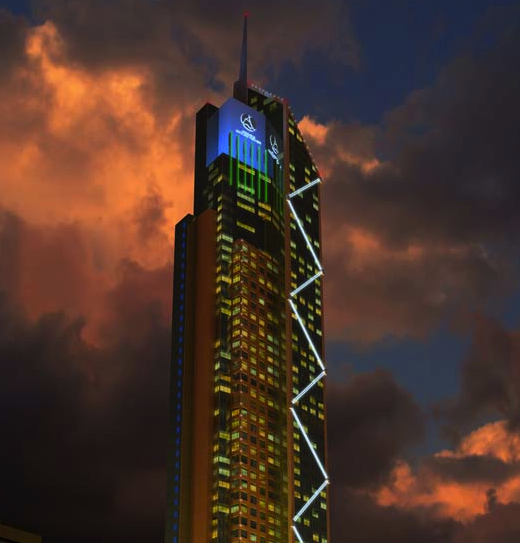 The Arraya Tower in Kuwait City, Kuwait is exactly 60 stories, and was the tallest building in the country from its completion in 2009 until 2011, when the Al Hamra Tower opened. The building was designed by Denver-based architect Curtis Fentress, who is best known for designing the Denver International Airport. Yep, I climbed that! I’m adding it to my Skyscraper Collection now. This entry was posted on Wednesday, July 25th, 2012 at 11:50 pm and is filed under Uncategorized. You can follow any responses to this entry through the RSS 2.0 feed. You can leave a response, or trackback from your own site. Ha, I know the feeling. When I was still using Herbalife, I once made a trip for a training and didn’t have any milk, so I thought, what the heck, just use water with the powder, what can go wrong, they even say you can use it with water. You probably shd have made the oatmeal first, then stir the powder in at the end. U cd also add yogurt or cottage cheese for protein (+ use less of the powder since u don’t like it so much).